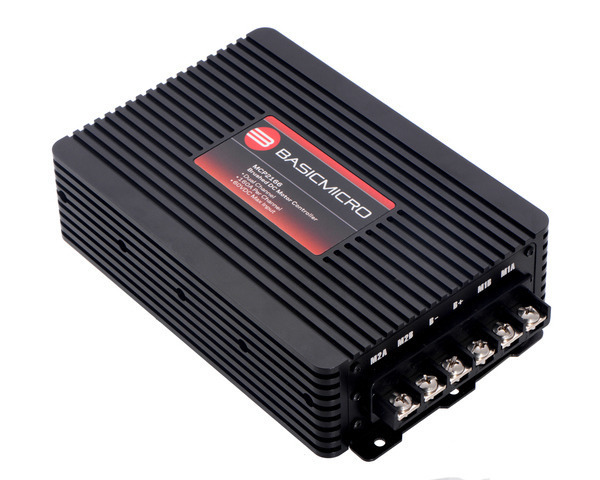 The MCP series from Basicmicro (formerly Ion Motion Control) are a family of rugged, high-performance motor controllers with scripting support and other advanced features. They can supply brushed DC motors with 30 A, 60 A, or 120 A continuous at voltages from 10 V up to 60 V (depending on the model). 1 Including connectors and mounting flanges. Each MCP motor controller has a USB interface that acts as a virtual serial (COM) port, allowing it to be controlled directly from a computer, and it features built-in commands for controlling acceleration, deceleration, distance, speed, voltage and current limits, and more. Several other interface modes are supported by the MCP as well: it can be controlled via TTL serial, RS-232 serial, or CAN bus (using the CANopen protocol) for use with an embedded or industrial system; RC hobby servo pulses for use as an RC-controlled electronic speed control (ESC); or analog voltages for use with potentiometers or analog joysticks. 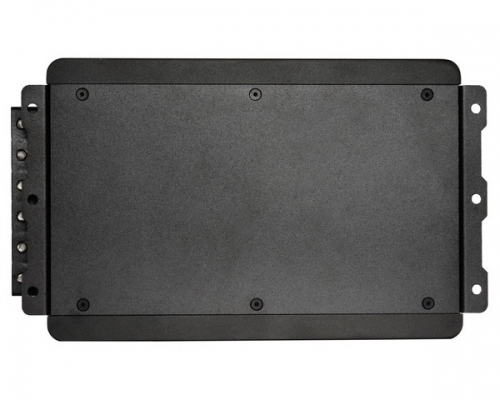 The MCP features an internal user scripting system and user-configurable I/O pins that allows it to be used as a standalone controller, eliminating the need for an additional processor in many situations. It can be operated without feedback for open-loop speed control, or it can be used with a variety of feedback types for closed-loop speed or position control. A wide range of closed-loop sensors are supported, including quadrature encoders, analog encoders, and potentiometers. The MCP incorporates several protection features including temperature, current, over-voltage, and under-voltage limits. Several user-definable settings such as a maximum current limit and battery voltage limits are provided for more refined control. The controller uses regenerative braking but can be configured with a voltage clamp circuit to limit the regenerative voltage when used with switching power supplies. The MCP2166 operates from 10 V to 60 V and can deliver a typical continuous output current of 120 A per channel (160 A peak). It has a USB Type B connector and three rectangular “Molex”-style connectors for control, feedback, and user I/O. (Mating connectors are specified in its datasheet). Up to 20 digital user inputs are available, 11 of which can be configured as analog inputs and 13 of which can be configured as PWM inputs. 8 user outputs are available; these are open-drain (they can drive low to sink up to 1 A or be set to high impedance) and are 40 V tolerant. MCP233 or MCP236 motor controller, bottom view. MCP263 or MCP266 motor controller, bottom view. MCP2163 or MCP2166 motor controller, bottom view.